I always joked when I was younger that at 30yrs I would start getting Botox and at 50yrs I’d get a facelift. Ha, ha – the naivety of youth! It’s funny how scared we are of ageing, even when we are so young! Funnily enough, now that I’m early 30’s, I’m more comfortable in my skin than ever! In saying that, I still believe in being the best version of ‘you’ ….so that the time has come for me to start considering therapies. I thought it best (and far less painful) to start with the least intrusive options. 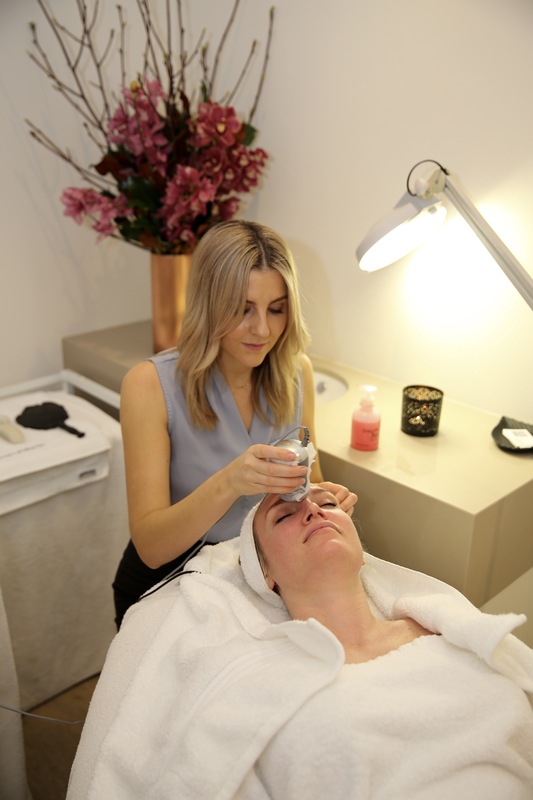 I recently visited my friends at Skin Rescue Centre in Double Bay to trial the SRS – Structural Remodelling Treatment. Let me start by saying I was sceptical. Very sceptical. Sarah Flood (who is amazing) is my therapist at Skin Rescue Centre and has been looking after my skin for a few years now… so it was at her recommendation that I gave SRS a go. The Claims: This skin toning system is the first of its kind to offer revolutionary remodelling. It combines 5 scientifically proven technologies to tighten and reshape the face and neck area. Each treatment takes approximately 30 mins and is pain free. The Reality: I went in with quite red sensitive skin that was a little worse for wear with this freezing Winter season – needless to say I was looking forward to the treatment. Your skin is first cleansed of all makeup and a cool gel is applied across each section of your face as your therapist progresses across your forehead, down your cheeks and to your chin and neck. There is a slight tingling sensation but nothing uncomfortable. The process takes about half an hour and it’s recommended you do a course of 2 per week for 5 weeks to achieve the full benefits. In saying that, one treatment is plenty if you are just after a lift and a glow for a special event. The Results: Sarah passed me a mirror half way through to see the difference between the treated side of my face and the yet-to-be treated side… And the difference was pretty dramatic. I get the feeling she sensed my scepticism so this defiantly put my mind at ease. After the treatment, my skin felt lifted, firm and moisturised. The texture and results improved over the next few days. All-in-all I’m a fan. No pain and delivering obvious results – how could I not be an enthusiast?! Basically, it works! It’s painless & pretty quick. Highly recommend! Skin Rescue Centre has a special on SRS treatments for August only- $150 per treatment. Next Wine. That is all. OMG! I’ve never heard about this before! Sounds amazing, especially because it’s pain free hahaha I just turned 30 and I’m all about going that extra mile to make my skin look better! Oh wow! This sounds amazing! I have never heard about this treatment before! I am all about finding new ways to keep my skin soft and young looking especially after turning 30 it finally sunk in that I will not look like this forever! lol! The skin rescue centre sounds amazing!!! I’m quite scared when It comes to needles and surgical procedures. The treatment that the Skin Rescue centre offers sounds exactly that I need!!! I can feel that my skin is loosing its collagen on my face and I have to admit that we can’t defy the age sometimes. Looks like SRS treatments are giving me new hopes, and I have to try it soon!!! That’s so funny – I don’t think I would consider botox before 50 and not sure I’d ever do a facelift – seems so invasive. That’s said I think I’d love to try SRS now. You had me at 30 minutes and pain-free 🙂 How long do the results last? $150 seems like a pretty good deal – that’s pretty much what you pay for a facial around here. Oh wow this review kinda piqued my interest in this amazing SRS treatment. Any before / after photos for comparison? The treatment being pain-free alone is a catch cuz I can’t tolerate those painful sensations whilst doing skin lasers. That treatment is amazing! I would love to make it, because my skin looks horrible now. I love treatments with lifting effect, cuz you really can see the difference! This sounds amazing and like something I would need come winter this year! My skin always gets red and dry and I seriously need something to revitalize it! It’s crazy how much facial treatments really make a difference. And I think I need to start investing in some of these things as I’m about to be 30 and it seems like the right time to be thinking about it! I’m a wuss when it comes to anything that sounds invasive or painful so if the treatment is painless and gets you looking younger then sign me up because I’m not getting any younger haha! It sounds like something I’ll have to try! It sounds like an amazing treatment and definitely worth trying in your early 30s when your skin is still young enough. I would love to try this one too, it seems like it works great even for the sensitive skin. I have hit my late 30’s and am doing all kinds of research on resurfacing and renewal and the SRS sounds wonderful as it is painless, non-invasive and provide real results. I will def research for such treatments in LA and see if I can get a consultation soon. Thank you for sharing your experience. This treatment sounds amazing, and I think I may need to do it. My skin is getting a little dull and this perhaps is a good option. I like how you said it’s lifting. That’s exactly what my skin needs. Thank you for sharing your experience. I thought this treatment would be super expensive- so I was happy to see that you mentioned it was $150- which is super affordable! That’s awesome that you could literally see the difference between the two sides of your face- it sounds like it really works. I always joke to my partner that I will get botox when I hit 30 too 😉 But that’s only 4 years away so maybe I’ll try some treatments like this instead. Ahh love how informative this post is thanks for sharing! Defo need to check this cosmotolegist out 🙂 I prefer non invasive treatments toon! I love this post! I took an aging course in college which was supposed to prepare you for aging, but in actuality it scared me and I’ve dreaded it ever since! I haven’t even reached 30 yet and I have thought of Botox. Lol. The structural remodeling treatment sounds like a good one! I like that it tightens your skin and relaxes dynamic skin lines. This I need! Thank you for sharing!